Inspired by the discovery of primeval ruins, Marataba embraces both the contemporary and the ancient in an exciting union of innovative architecture, design and technology, paying tribute to, and confirming, the concept of the African Renaissance. Lulled by the heartbeat of the bushveld, awed by towering mountains, enthralled by the abundance of wildlife, secure and sensually nurtured in the indulgent atmosphere, live your dreams of safari at Marataba, the place where the plains touch the mountains. Marataba is a member of Relais & Chateaux. Marataba Safari Company's exclusive concession lies in the magnificent Contract National Park to the east of the Marakele National Park in Western Limpopo. The park is situated at the foot of the Waterberg Mountains, approximately 3 hours drive north of Johannesburg and about an hour and 20 min from Sun City in western Limpopo. Thabazimbi, Rustenburg and Lephalale are all within easy reach. There is a mystical place at the foot of the Waterberg Mountains on the ancient trade route through southern Africa, from the mighty tower of "Great Zimbabwe", over the raging Limpopo River and across vast plains teeming with game. In this hidden place, discover Marataba, epitomising all that is Africa. This luxurious game lodge reflects Africa's ancient wisdom and culture, the glorious forms and colour presenting a vibrant haven at the epicenter of modern design. Enter a sanctuary of mystery in harmony with the energy of nature and the environment, built of indigenous stone, timber, sand and soil,enhanced by murmuring waters and vast vistas liberated by glass walls. Within a dramatic landscape encompassing vast plains, dense bushveld, winding rivers, deep gorges and majestic mountains, Marataba is an exclusive 23,000 hectare private concession in the heart of Limpopo's Marakele National Park, a 'place of sanctuary' for Africa's Big Five and a multitude of other animal species including rare antelope such as roan, sable and mountain reedbuck. This malaria-free wilderness is also home to the world's largest breeding colony of the endangered Cape Vulture. Birdlife within the park is prolific with more than 400 species having been recorded, a veritable birder's Eden. Evocative of ancient African remains, stone-masonry characterises the main lodge with huge expanses of glass taking full advantage of the spectacular panoramic scenery. Admire the view while enjoying a cocktail in the Ladies Bar or simply relax in The Wallow with a book from the library, housed within the stone tower with a birds-eye view of the breathtaking surroundings. 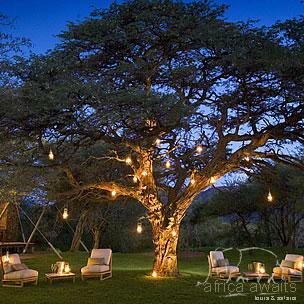 Gourmet cuisine with fresh African flavours is served either in the elegantly appointed dining room or outdoors on the dining verandah or, alternatively, under a glorious African sky. And, as temperatures rise in Limpopo, cool off in the crystal clear pool. The Main Lodge also boasts a Guest Business Centre for those guests who cannot totally escape the outside world. Mobile phone reception is erratic. Marataba is an ideal wedding and incentive destination with tailor-made options and activities available on request. 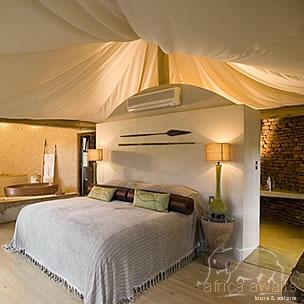 Saturated with the sights, sounds and smells of the African wilderness, indulge in the supreme luxury of our exotic tented suites, an intriguing mix of canvas, timber and stone, exquisitely furnished and decorated. En-suite stone bathrooms, with both shower and bath, as well as his and hers basins and dressing room are the epitome of bushveld opulence. 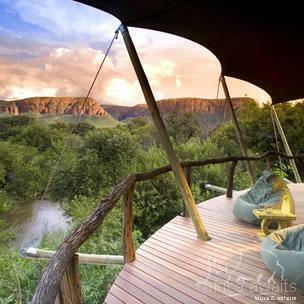 The 15 luxury suites each have their own private deck overlooking the sweeping plains and meandering river below. Other facilities include an outside shower, ceiling fan, air conditioning and in-house communication. During the summer months from September to April the weather is warm to hot with wonderful balmy evenings. During January, the hottest month of the year, temperatures average 32 oC. Rainfall (570mm per annum) occurs mainly in summer in the form of afternoon thundershowers. The winter is chilly at night and early in the mornings but the daytime temperatures are pleasantly warm. Although the weather is generally quite hot, it is advisable to have warmer clothing available for game drives in Marataba's open game-viewing vehicles, which can be chilly particularly in winter. The Marakele National Park in the heart of the Waterberg Mountains, as its Tswana name suggests, has become a 'place of sanctuary' for an impressive variety of wildlife due to its location in the transitional zone between the dry western and moister eastern regions of South Africa. Contrasting majestic mountain landscapes, grass-clad hills and deep valleys characterize the park. With your holiday, safari or business trip from in to Marataba in Marakele National Park.